Federal authorities reportedly arrested 17 people in South Florida – and are seeking dozens more – in connection with a pill mill operation that reportedly engaged in the trafficking of some 45,000 prescription Oxycodone pills. Our Fort Lauderdale criminal defense lawyers understand that officials with the U.S. Drug Enforcement Administration honed in on an operation in Dania Beach more than a year ago after a pharmacist called the state’s pill mill tip line to report a suspicious amount of pain medication being dispensed. Prescription drug trafficking and fraud are on the top of law enforcement’s priority list in Florida and in South Florida in particular, an area that has become notorious for easy access to habit-forming pills. A number of legislative measures, including the introduction of the pill mill tip line, have been introduced in recent years to combat the problem. There was also the establishment of the “pill mill database,” which aims to curb doctor-shopping and prescription fraud by requiring physicians to submit the names of those given certain types of pain medications. However, addiction is powerful, so demand remains high and law enforcement officials remain on alert. These types of sweeps are not uncommon. According to the Sun-Sentinel, after that initial tip came in, investigators uncovered a network of at least 45 individuals who were allegedly using stolen prescription pads to obtain tens of thousands of pain pills to sell on the street. To give you an idea of the profit margin here, a single Oxycodone pill can command $30 on the street, which means a full bottle of 180 pills could generate a $3,000 profit for the person selling. In addition to arresting those involved in the street sales, agents also arrested four of those who worked at the Palm Beach County pain management facility, which dissolved last year after failure to file annual state reports. While conducting the sweep in the early morning hours, detectives also reportedly found $7,000 in cash at one location, along with two kilograms of cocaine and an AK-47 assault rifle. Although such actions can result in federal drug trafficking charges, those arrested in the course of this investigation will be prosecuted at the state level. But make no mistake: state charges aren’t any less serious. 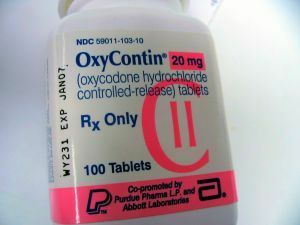 Florida Statute 893.135 holds that any person who intentionally and illegally sells, buys, manufactures, delivers into the state or is in possession of more than 30 grams of controlled prescription drugs, such as Oxycodone, Hydrocodone, opium or morphine is guilty of drug trafficking, which is a first-degree felony, punishable by between 15 to 25 years in prison. If a person subsequently overdoses and dies as a result of that act, it’s considered a capital felony. In this case, officials say they consider this “a good start,” and intend to continue searching for the remaining suspects. Unfortunately, those arrested on charges connected to prescription drug abuse may fail to take the charges seriously. Often, these defendants have little experience with the criminal justice system. Failure to consult with an experienced criminal defense attorney in Broward can have significant consequences. If you’re arrested for illegal possession or trafficking of prescription drugs, don’t take any chances with your future. Immediately contact an experienced criminal defense firm. You have a number of effective defense strategies to consider.